There are quite a few medical schools operating in the Caribbean. This has been a source of everything from hope and opportunity to stress and uncertainty over the past half century or so for US and Canadian students. And while we obviously think that we're the best choice for anyone considering an international medical education, we wanted to take an opportunity to discuss a major ally of ours in the fight for quality: The ECFMG. Today, we're going to discuss what the Education Commission for Foreign Medical Graduates (ECFMG) actually is and what it isn't. We'll also get into how they're making the Caribbean a better place for students considering an education abroad. (You will be unsurprised to find that Trinity ticks all of their boxes as one of the best schools in the region). First, let's talk about what the ECFMG actually is. 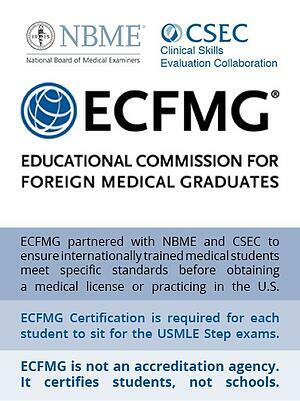 The ECFMG is a partner of the National Board of Medical Examiners (NBME) and the Clinical Skills Evaluation Collaboration (CSEC) to ensure any internationally trained medical students meet specific standards prior to obtaining a medical license or practicing medicine of any kind in the United States. ECFMG Certification is required for each student to sit for the USMLE Step exams, the exams that all students intent on practicing in the US must pass for licensure. You'll note we said, "required for each student" not "school." This leads us to what the ECFMG isn't. It's not an accreditation agency. It certifies students, not schools, to take the USMLE licensing exams. Be wary of any school claiming an ECFMG accreditation. It doesn't exist. However, the ECFMG is wielding its authority in a new way starting in 2023 (bear in mind this is the graduation year for any student starting medical school in 2019, more on that later). However, the ramifications are already taking hold right now, with schools "ghosting" their students and shutting down with little to no notice or recourse. While the rule takes full effect in 2023, the speculation has been it will start to have a serious impact as early as 2019. The concern is that that state medical boards, even those without restrictions on schools or their students, may start to deny applications for licensure from students that did not spend all four years of their education at a federally-recognized-as-accredited program. It turns out this was a conservative estimate: schools are already closing now, at the end of 2018. Schools have already started closing their doors, putting campuses up for sale, and leaving their students out in the cold. A tremendous influx of students seeking to transfer have reached out as a result. As heartbreaking as it is for those students already affected at these other schools, this change via the ECFMG is a celebration of good faith operation and quality education. In many ways, top schools like Trinity, and students across the region have been waiting for this last gap in the system to be closed for years. We could not be more excited as a result. The ECFMG is not stopping there, though. They've actually published a guide to help students navigate through choosing an international medical school at all, even those that will remain open past 2023. We thought we'd go through each item and show you how Trinity stacks up. Accreditation. School accreditation should be regionally appropriate. In another item, they also want you to understand what accreditation really is, so we're adding that in here. 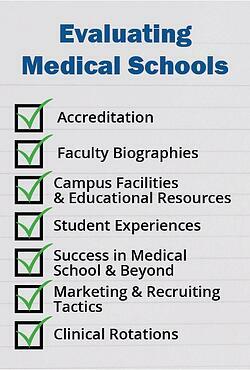 They also note that (as we said earlier), the ECFMG, IMED, FAIMER, and WHO don't accredit schools. Be wary of institutions that say they do! Our accreditation page is available here for comparison. You can learn more about CAAM-HP itself, here. And here is the US Department of Education finding our accreditor as comparable to the LCME. Faculty and Curriculum. The ECFMG suggests evaluating faculty, noting a presence of biographies, as well as how comprehensive the curriculum is. We firmly agree, this is an excellent way to dig deeper into the academic rigor of the institution! Our faculty biographies can be found here. Our curriculum is here, each course has a complete syllabus available on that page, as well as our full handbook covering school policies as well as additional course information. And finally, as a bonus, our ongoing research is published here. The ECFMG suggests visiting a school and evaluating technology, labs, facilities, etc. While this can be difficult with international schools, Trinity actually offers a generous tuition credit of $1,500 USD for any applicants seeking to visit campus prior to matriculation to help cover cost of travel. First, we enable this as much as we can during the admissions process through contacts in applicants' home state or possible residency target (or province, in the case of Canadians). To provide additional resources, we have the ongoing alumi spotlight blog series as well as our student achievement page and our newly launched and rapidly growing Alumni Association. Finally, while it's post-admission, our students are welcomed to campus by the head of student services Keith Hollers and his team of student volunteers, The Welcoming Committee! New students are immediately shown the ropes by upperclassmen and given a mix of organized and unofficial time to socialize before starting their coursework. Marketing and Recruiting. The ECFMG suggests making sure schools aren't using stock photos or advertising dubiously high USMLE performance and match rates (99-100%). This was an especially proud moment for us. First, the photos on our website and blog are all Trinity students either on our campus or out in the community on St. Vincent, in Baltimore, etc. More than just accurately representing our school, we're quite frankly very proud of our students and want to show off their success to the world. Similarly, we have never been shy about our student outcomes data like match rate (84%), Step 1 average scores (220) and pass rates (93%), all available here. Student outcomes are university outcomes, and each year as we continue to grow, we strive to offer more and more for our students. That means being honest about what the numbers are, what they indicate, but also that studying abroad is often about the opportunity to succeed that you were denied at home in the US and Canadian systems. That can mean schools and students alike taking a chance together and owing each other their unadulterated best. There's greater context to consider, though. At Trinity, we have a very low attrition rate of 12%. Attrition is the hidden factor in these numbers. Here's why. There are larger Caribbean schools out there boasting 600+ new residents in a given year. What they leave out is that their starting class had 1500 students in it. The majority of those students are ejected from the program prior to taking the USMLE Step-1 exam. A 93% pass rate at Trinity comes from a higher proportion of a medical student class than at any other school in the Caribbean. Whatever a school's USMLE pass rate is, always ask about attrition. It's the hidden factor that can determine your future and reveal whether a school is about teaching you to swim or letting you drown. Clinical rotations. They want you to know what the clinical experience is like at your future medical school, including where they are. And we agree! That's why our rotations are outlined here. That's also why we made sure our core rotations are all in one location, Baltimore, Maryland. Historically, Caribbean schools scatter their students across the US and Canada and have them move around multiple times in short succession. The model for US schools is one location (except for away rotations) for a reason: it works. Students unsure of whether a spot is available, what they'll study when, even where, is stress above and beyond studying medicine. We followed the US approach to medical school to continue our culture of support and acting in the students' best interest. Our students had complete clinical study plans when they start rotations and know where they'd be, start to finish: Baltimore. For the past ten years, Trinity School of Medicine has operated under a guiding principle of striving to be the best option for anyone looking to study medicine abroad. That meant staying small, staying focused, and staying honest, with ourselves and our students. It's worked out very well, too. We once saw someone sarcastically refer to us as, "The mighty Trinity School of Medicine" because of our size and, at that point, relative youth. As the landscape of medical education in the Caribbean changes, we're proud to see how that isn't a joke anymore. Put another way, when the ECFMG said "get on our level?" We were already there. It's a great feeling. We hope you'll join us and find out for yourself.